Central control by GLP-1 of whole-body GIR. 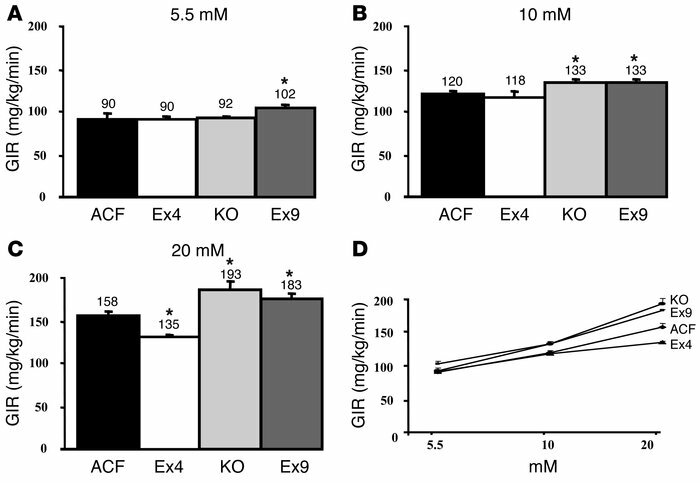 GIR (mg/kg/min) was calculated in steady-state euglycemic hyperinsulinemic conditions (5.5 mM; A) and in hyperglycemic conditions (10 mM, B; and 20 mM, C) in C57BL/6 control mice with ACF, Ex4, or GLP-1 antagonist Ex9 infused into their brains and in GLP-1 receptor KO mice (KO). Values are shown above each bar; error bars indicate ± SEM. (D) Dose response to glucose in all sets of mice plotted against GIRs in order to calculate the r2 of each curve. The mean of 6–11 mice per group is shown. *P < 0.05 versus icv ACF-infused mice.